During his distinguished career as a registered patent attorney, Michael has been a partner in two prestigious national law firms. An inventor himself, he has successfully patented, licensed and assisted in the enforcement of his clients’, his company’s and his own technology. The patent process is a time sensitive business. The applications Michael writes for clients are filed without delay, and carefully crafted to remain relevant in the future. You didn’t spend years developing your invention for the fun of it. You want to turn it into an income realizing property. Michael’s patent applications are written with an eye toward monetizing the product or process, drawing on his significant experience in the areas of post-issuance proceedings including manufacturing, litigation and licensing. 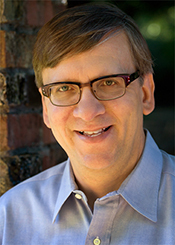 As YourPatentGuy, Michael believes in long-term collaborations with clients. After filing your application, he will follow through with patent prosecution, handle related applications (both domestic and international) and any issues that may arise concerning enforcement, possible litigation and licensing. 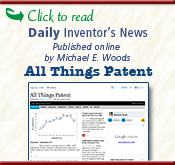 Michael has been using electronic filing for patent applications for years. Since the USPTO instituted changes making it easier to file electronically, many firms have followed his lead. E-filing saves money for many inventors and ensures immediate confirmation from the USPTO. Michael is implementing additional state-of-the-art technologies to make the entire process more accurate and efficient, saving clients time and money. He also offers such big firm features as off-site backup of your important files, and automated document assembly and document management, among other features and advantages. When you hire Michael E. Woods, you get Michael E. Woods. A solo practitioner, you’ll always have his full attention. Without the overhead of a large law firm, and by using technology automation, Michael offers his superior services at attractive rates.